In a ploy that could save the company millions of dollars and potentially protect it from ongoing lawsuits, a private ambulance outfit has poured $21,900,786 to date into the statewide campaign to pass Proposition 11, a measure on the November ballot that regulates lunch and rest breaks for people who work in ambulances. Per the most recent campaign documents filed on Sept. 27, no other donors have given to the Yes on 11 campaign. Ambulance workers say the proposition would change nothing about the way their breaks currently work, their training, or the mental health services they receive. Instead, they say, the proposition is aimed at shielding the Colorado-based American Medical Response Company, known as AMR, from more than $100 million of potential liability in pending and future lawsuits and $100 million in increased costs if AMR has to add employees to cover drivers during their lunch breaks. Even the hefty amount the company has thus far spent on pushing Proposition 11 is dwarfed by what the company would otherwise be on the hook for. “That’s a four-to-one return on investment,” explains Jason Brollini, an AMR paramedic for 25 years and the executive director of United EMS Workers, a union that represents AMR workers in San Francisco and elsewhere. The California Labor Federation opposes Prop. 11, but its campaign pales in comparison to AMR’s spending. A No on Prop. 11 Facebook page funded by the labor union AFSCME has 191 likes and four posts. An official No on 11 committee does not exist. And unions failed to submit opposition arguments to the California Official Voter Guide in time, so the proposition appears unopposed. On its surface, Proposition 11 would allow private ambulance companies to continue their current practice of keeping workers “on duty” during paid lunch and rest breaks. That means workers listen to their radios for 911 calls and respond if necessary. But that is already true today. AMR workers, however, say the company’s real M.O. is to indemnify itself itself from pending lawsuits that aim to change the status quo on breaks — and, if successful, would force AMR to pay damages and penalties to employees. “It’s intellectually dishonest,” said Brollini. The California legislative analyst’s report generally agrees. Under Prop. 11, the report concluded, “ambulance companies would avoid” the costs of providing off-duty meal and rest breaks required by state law — costs that would likely be passed on to the counties they serve. Problems began to arise for AMR when the California State Supreme Court ruled in December 2016 that private security guards must have breaks during which they are relieved of all duties. If the ruling in Augustus v. ABM is applied to private emergency medical service workers, it would mean AMR may have to increase staffing to cover its workers’ breaks. This could cost the company millions of dollars statewide, on top of the millions in liability for the pending suits. From the point of view of several workers, AMR added language to the proposition to appeal to voters, by requiring employers to “provide training regarding certain emergency incidents, violence prevention, and mental health and wellness” for ambulance workers. But Brollini and Almeida both say the workers already receive this training. Brollini adds that the mental health counselors AMR offers do a good job, but are not equipped to help them with the traumatic stress they deal with and its aftermath. AMR’s campaign in favor of the proposition has argued that if it does not pass, public safety would be put at risk. AMR workers, however, worry that voters simply trying to do the right thing could be fooled. “It’s disappointing to me that AMR would hide behind key phrases that prey on the public’s fear,” said Jocelyn Paulson, who has been a paramedic with AMR in Santa Clara County for 17 years. AMR has also distinguished itself by becoming the third-largest single donor to any state initiative campaign this year, ranking behind two other medical groups opposing Proposition 8, which would regulate clinic charges for outpatients kidney dialysis. 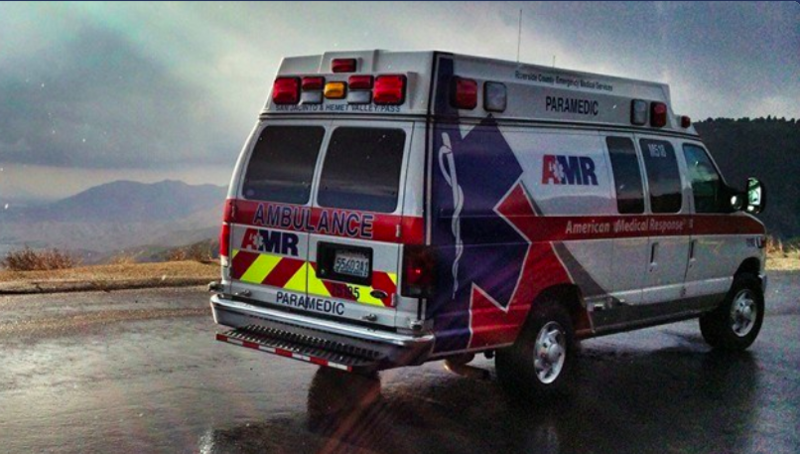 Both AMR and its workers generally agree that the nature of being a paramedic requires workers to be on duty during their breaks, and ready to respond to emergencies. “None of my guys find it acceptable to say, ‘nope, I’m not responding to that 911 call,’” said Brollini. To rectify this reality with the 2016 State Supreme Court ruling in Augustus v. ABM, private EMS workers and elected officials tried to agree on legislation. In early 2017, Assemblymember Freddie Rodriguez (D-Pomona), a former EMS worker, introduced AB 263, which would have required that a worker’s break only be interrupted for emergencies that required an ambulance to activate its lights and sirens. For such interruptions, the employer would have to compensate the worker an extra hour of pay. While the legislation was being discussed, a lawsuit called Bartoni v. AMR, which had sought but been denied class-action status over break violations committed by AMR, was revived because of the State Supreme Court’s ruling in Augustus. Bartoni, the court ruled, could continue to pursue class-action status, which it gained in early 2018. Within a month of Rodriguez withdrawing his compromise measure, an AMR representative named Sean Henschel had started the process for a ballot initiative. Collecting signatures to qualify Prop. 11 for the ballot cost AMR about $3 million, according to campaign finance documents. “This is a way to try to limit their liability,” said Brollini, a proponent of the legislative solution. Prop. 11 “is not going to change what we have done for the last 25 years. It’s not going to change the status quo.” But, he affirms, it will save AMR millions. Disclosure: From 2013 to 2014, Eric Murphy was employed by AFSCME International. United EMS Workers is a subdivision of that union. When did this proposition become all about AMR? The rest of us that work for companies that take care if us will suffer as well. Private ambulance service is going to be damaged if 11 does not pass. it’s unsustainable with the billed returns from government issued insurance does not cover the hourly cost of ambulance service. AMR does not treat their people well obviously, but that should not disrupt service, and don’t believe the hype “my radio is always on” misnomer. The company will not be able to even contact a “dark” unit on their break. Voting “no” is going to end private ambulance service and hurt service to rural communities. I will vote NO on 11,it’s not like a ambulance is working every minute of the day,eat when you can and do your job when the call comes in. It became about AMR when it was created and funded by them. It was created in hopes to get out of paying millions. AMR is the biggest provider and the smaller companies can’t compete. Just wait, all the money they save by passing this they will use on buying out smaller private companies! Not investing in the employees they have now. Like a cost of living increase that we haven’t seen in several years. Those of remaining in the business do it because of the job not the employer. We shouldn’t have to just do our jobs and keep quiet for 12-14 1/2 hours a day without a break or guaranteed down time to eat or just de-stress during a grueling shift! Service will never be disrupted as they have contract obligations to the counties they serve, which even without lunch breaks they minimize staffing to keep their numbers low. They simply are in it for the money. The idea is to have enough staffing so the units running back to back 911 and transfers can stop and eat. Why is that so far fetched? I’ve been in EMS for 17 years and maybe long ago we didn’t make a big deal about lunches but there wasn’t the call volume and changes to the job! AMR has taken away safe quarters for employees to cut cost and now they post on the street corners of some pretty unsafe neighborhoods. No safe / comfortable place to sit and eat unless you call eating in your ambulance acceptable! Think about it, doesn’t seem unreasonable at all! AMR. Worst company ever! Too bad they can’t spend that money on their employees. AMR is the modern day mafia, they have enough money to bribe cities to cut out independent companies so they can monopolize in EMS, rates usually go for cost of labor and charges for everything stocked in the rug, drugs etcetera for ALS units. Emts are always on call, and sometimes don’t receive their breaks, companies make more profit by skipping lunches and paying units for missed meals then they do by giving crews lunch breaks. Look at it this way you have 10 crews that make $10.00 hr. That’s 20 dollars a crew, would you choose to lose 200 dollars for not giving lunch breaks or over 10.000 for giving them lunch. A yes vote just means they can constantly get away with not giving crews lunches without fear of lawsuits. I’d vote no, you worry about your safety emts are always on standby even on lunch, we ditch food we ordered just to go help others. We’ll always come. This Prop if passed will protect all privately ran ambulances from any future lawsuits regarding meal breaks as it’s required by current labor laws. This Prop does not also fully explain about non emergency calls which 80% of private ambulances. This Prop only protects the company not the employees. Not even the customers.